and prizes every 3 months for Top Poster,Best thread and best advice. So it well worth getting involed. Where you fish: : A Puddle!!! Our main business activity is wholesale - supply to shops. But we don't avoid even to supply every single customer, every angler. Ichthys manufacture hundreds of different styles of swivels and they have launched a complete range for the specimen fishing. The Group has more than 17 years of experience in development and production quality fishing equipment. The company is being represented in the UK by E.F.ExtremeFishingSport of Evesham - Exclusive Official Supplier & Distributor of Ichthys products - and are looking to expand into the UK and Europe. The range consist of many different types of swivel, which a huge selection of sizes and shapes. 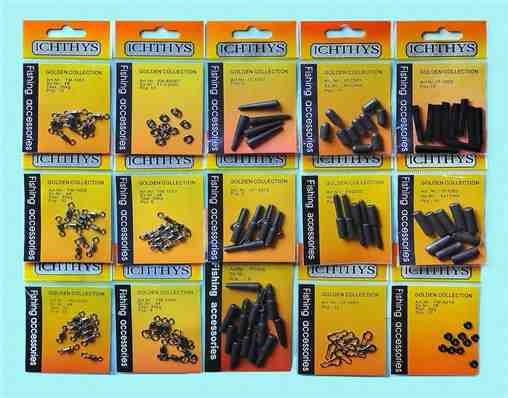 Also in the range are boilie stops, lead clips, rig rings, shrink tubing, back lead clips .... Together more than 600 products. We offer innovated and developed products in the biggest range in Europe.